Wine tasting in Grand Junction, Lake Powell cruise, 4-wheel-drive tour in Monument Valley, Durango & Silverton Narrow-Gauge Railroad, and Pike’s Peak Cog Railway. Vail, Glenwood Canyon, Colorado National Monument, Arches National Park, Canyonlands National Park, Dead Horse Point State Park, Capitol Reef National Park, Grand Staircase Escalante National Monument, Bryce Canyon National Park, Zion National Park, Wupatki National Monument, Grand Canyon National Park, Monument Valley, Four Corners, Mesa Verde National Park, Black Canyon of the Gunnison National Park, and Garden of the Gods. Welcome to Denver, the “Mile High City,” capital of Colorado and gateway to the Rocky Mountains. An attractive city with broad streets, a tree-lined pedestrian mall leads to the gold-domed State Capitol and Larimer Square in the city’s historic heart. Enjoy time at leisure to relax or to do some independent exploring. Your Tour Director is on hand this evening to answer any questions. DENVER Comfort Inn Downtown Denver (ST). Day 2 Denver–Vail–Glenwood Canyon–Grand Junction. 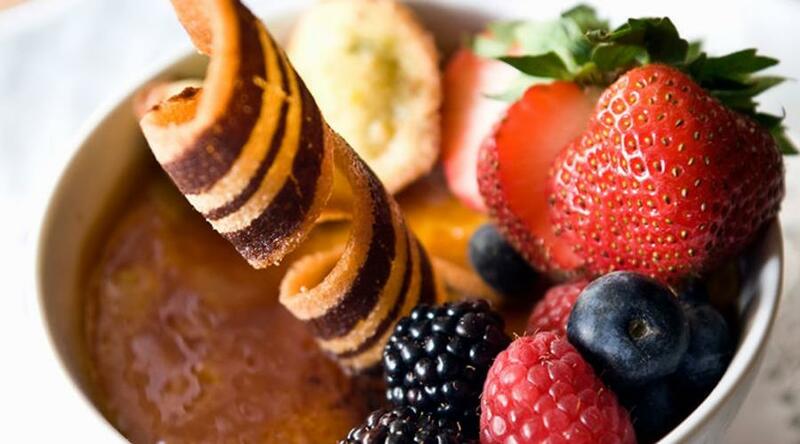 Travel west into the Rocky Mountains and stop in Vail, one of America’s most popular mountain resorts. Your journey continues through the massive 1,800-foot-high walls of Glenwood Canyon before reaching the awe-inspiring natural beauty and dramatic red-rock landscape of Grand Junction. Colorado wines are making a big splash, and the heart of the Colorado wine industry is right here. Upon arrival, enjoy a WINE TASTING at one of the many wineries. (CB) DENVER Comfort Inn Downtown Denver (ST). Day 3 Grand Junction–Colorado National Monument–Arches National Park–Moab. This morning, visit COLORADO NATIONAL MONUMENT with its canyons that drop as much as 500 feet deep. On to ARCHES NATIONAL PARK, with over 2,000 preserved natural sandstone arches, including the world-famous Delicate Arch. Overnight in Moab, with time to stroll through the downtown shops for a great selection of Southwestern art and jewelry. GRAND JUNCTION Doubletree by Hilton Grand Junction (F). Day 4 Moab. Excursion to Canyonlands National Park & Dead Horse Point State Park. The day begins with magnificent CANYONLANDS NATIONAL PARK, a colorful landscape eroded into countless canyons, mesas, and buttes by the Colorado and Green Rivers. The remote Maze, the rugged Needles, and our destination today, “The Island in the Sky.” Continue on to DEAD HORSE POINT STATE PARK, where your Tour Director tells you the legend behind the name. Stroll along the Rim Walk, towering 2,000 feet directly above the Colorado River. Dead Horse Point Mesa provides breathtaking views of southeastern Utah’s canyon country and the pinnacles and buttes of Canyonlands National Park. MOAB Big Horn Lodge (ST). Day 5 Moab–Capitol Reef National Park–Bryce Canyon National Park. Today’s route through CAPITOL REEF NATIONAL PARK and Escalante is one of the most spectacular, yet unknown, scenic drives in the USA. The majesty of Capitol Reef will intrigue you with its twisting canyons, massive domes, monoliths, and spires of sandstone. Next, travel along GRAND STAIRCASE-ESCALANTE NATIONAL MONUMENT to BRYCE CANYON NATIONAL PARK, where slow erosion over the ages has created fantastically sculpted rock formations resembling castle towers and cathedral spires. The natural amphitheaters and canyons glow with different lights throughout the day. MOAB Big Horn Lodge (ST). Day 6 Bryce Canyon National Park–Zion National Park–Page. 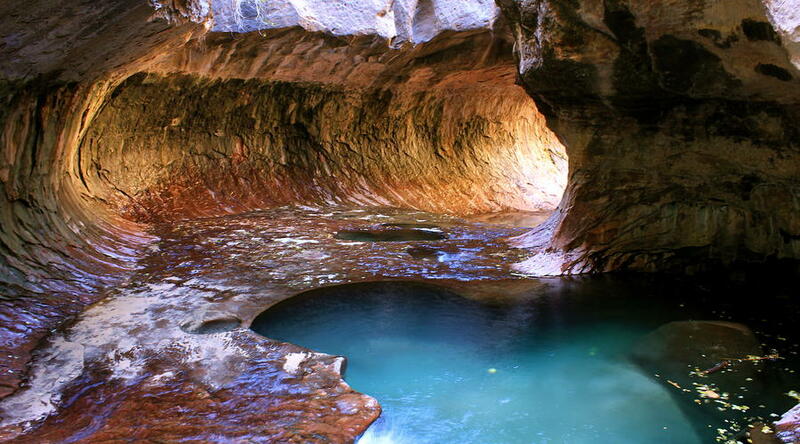 Today, descend into half-mile-deep ZION NATIONAL PARK. 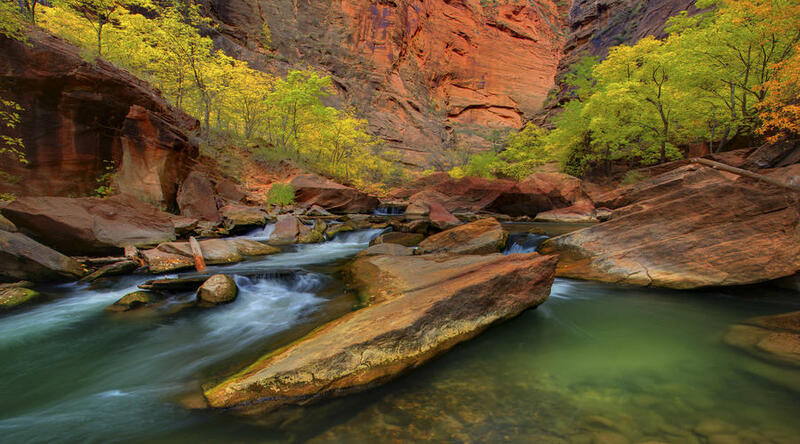 “Zion” means a place of peace and refuge. Enjoy the colorful sandstone walls that rise thousands of feet above the lush greenery of the canyon floor. Afterward, head east into Page on the shores of Lake Powell and CRUISE the waters of America’s second-largest man-made reservoir. BRYCE CANYON NATIONAL PARK Best Western Plus Ruby’s Inn (ST). First stop this morning is the WUPATKI NATIONAL MONUMENT, one of several sites preserving pueblos (village) of ancient peoples. Visit the visitor’s center and museum exhibits that feature the stories of people who have lived here through thousands of years. Take time to imagine the past before visiting one of the five largest prehistoric pueblos, the Wupatki Pueblo. An afternoon arrival in Flagstaff allows time to explore an eclectic mixture of big-city culture and charming downtown atmosphere. Our journey continues to Williams, a picturesque mountain town with Route 66 as the Main Street and the gateway to the Grand Canyon. Enjoy one of the best preserved stretches of the Mother Road in America. Walk Main Street and you’ll find vintage neon on buildings that are preserved to their original character, and restaurants that have the character of the Route 66 heyday. (CB) PAGE Quality Inn Lake Powell (ST). Day 8 Williams. Excursion Into Grand Canyon National Park. Today, experience one of the Natural Wonders of the World and see the beauty and splendor of the GRAND CANYON. The day is free to enjoy the park at your leisure. Wander along the canyon rim for breathtaking views. For a once-in-a-lifetime thrill, take an optional helicopter flightseeing trip over the Grand Canyon. WILLIAMS Grand Canyon Railway Hotel(F) or Days Inn Williams (ST). 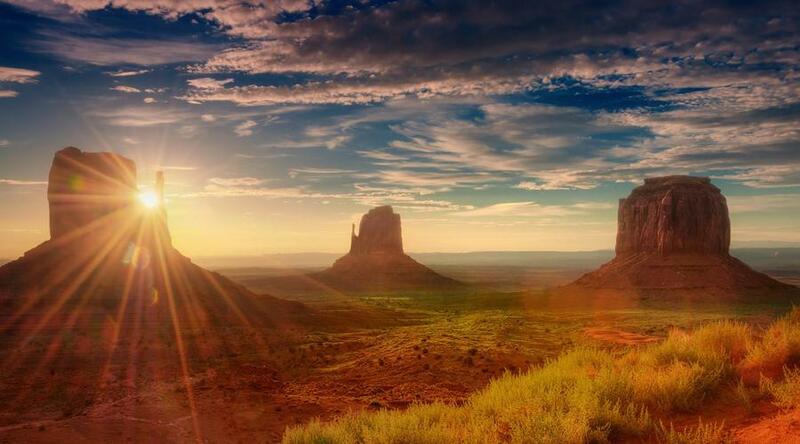 To experience the American West that’s been immortalized on the silver screen, journey across the Navajo Nation to MONUMENT VALLEY. Situated on the Arizona/Utah border, the valley’s scenic desert vistas and iconic buttes have appeared in countless classic Western films. See the massive formations on a memorable 4-WHEEL-DRIVE TOUR. WILLIAMS Grand Canyon Railway Hotel(F) or Days Inn Williams (ST). Day 10 Kayenta–Four Corners–Mesa Verde National Park–Durango. Today, continue through Utah to the “FOUR CORNERS” region, where Colorado, Utah, Arizona, and New Mexico converge, and you can stand in four states at the same time. Next, wondrous MESA VERDE NATIONAL PARK, a UNESCO World Heritage Site, where you walk in the footsteps of Ancestral Puebloans and see their mysterious, centuries-old cliff dwellings. Afterward, head to Durango in the Animas River Valley, surrounded by the San Juan Mountains. Tonight, maybe explore the historic downtown or stroll along the Animas River. KAYENTA Kayenta Monument Valley Inn (MF). Day 11 Durango. Excursion On The Durango & Silverton Narrow-Gauge Railroad. 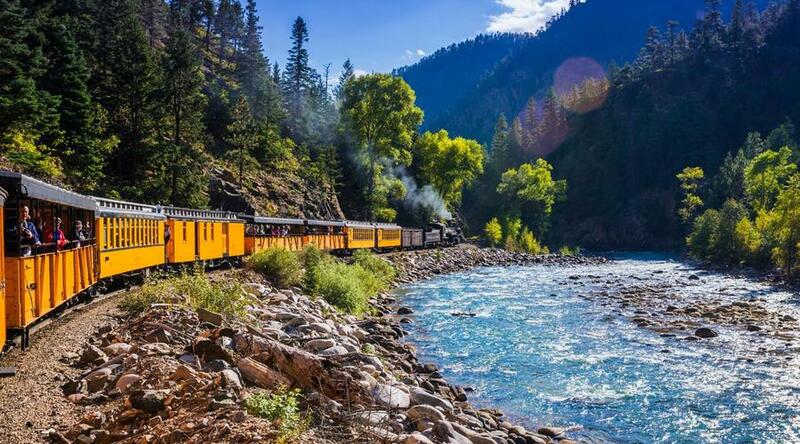 Board the DURANGO & SILVERTON NARROW-GAUGE RAILROAD this morning for a scenic ride through San Juan National Forest. Experience the adventure of traveling by a coal-fired, steam-powered locomotive on the same tracks that miners, cowboys, and settlers of the Old West took more than a century ago. This historic train has been in continuous operation for more than 125 years, and the locomotives used to pull today’s train are 1923-1925 vintage. The train hugs steep canyon walls as it winds its way through the Rio de las Animas Canyon, with vistas of snowcapped peaks. Free time in Silverton, once a major mining town that owes its name to the bragging statement by an early miner, “We have no gold, but silver by the ton!” DURANGO Durango Downtown Inn (MF). Travel north through the San Juan Mountains, stopping in Ouray, a small community nestled in some of the Rockies’ most rugged and towering peaks. 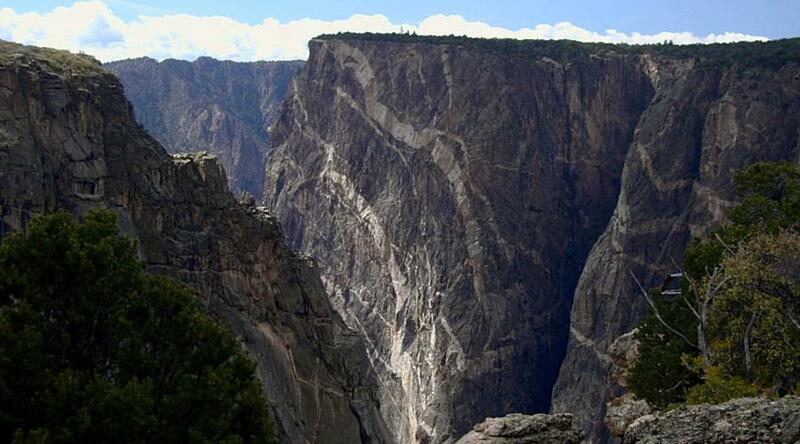 This afternoon, visit one of America’s newest national parks: BLACK CANYON OF THE GUNNISON NATIONAL PARK. The unique and spectacular landscape was formed slowly by the action of water and rock scouring. No other canyon in North America combines the narrow opening, sheer walls, and startling depths that you will see here. DURANGO Durango Downtown Inn (MF). Day 13 Gunnison–Buena Vista–Colorado Springs. Day 14 Colorado Springs–Pikes Peak Cog Railway–Denver. Conclude your journey with a fabulous train ride on the PIKE’S PEAK COG RAILWAY, the world’s highest cog railroad. Travel along Ruxton Creek in Englemann Canyon, then over Four Mile Switch for your first glimpse of Pikes Peak. At about the 5-mile point, the grade gets steep as you climb above the timberline and reach the 14,110-foot summit of Pikes Peak. Return to Denver in the late afternoon for an evening at leisure. (CB) COLORADO SPRINGS Comfort Inn South (ST). * NOTES: Colorado, Utah, and Arizona are blessed with exquisite mountain scenery and extraordinary outdoor attractions. Visiting and participating in activities in these locations is subject to favorable weather and or road conditions. Enjoy the spectacular colors of the West on our special fall foliage departures: September 18 & 25 (if Mother Nature permits). Wine tasting in Grand Junction, Lake Powell cruise, 4-wheel-drive tour in Monument Valley, Durango & Silverton Narrow-Gauge Railroad, and Pike’s Peak Cog Railway., Vail, Glenwood Canyon, Colorado National Monument, Arches National Park, Canyonlands National Park, Dead Horse Point State Park, Capitol Reef National Park, Grand Staircase Escalante National Monument, Bryce Canyon National Park, Zion National Park, Wupatki National Monument, Grand Canyon National Park, Monument Valley, Four Corners, Mesa Verde National Park, Black Canyon of the Gunnison National Park, and Garden of the Gods., Services of a professional Tour Director., Inside visits as shown in UPPERCASE in the tour description, including admission charges where applicable.